Clarence Smoyer was just 19 years old in March 1945 when he was part of a tank crew pushing its way slowly through Cologne. This was the US Army’s biggest house-to-house, street-by-street battle in Europe, and it certainly took its toll. 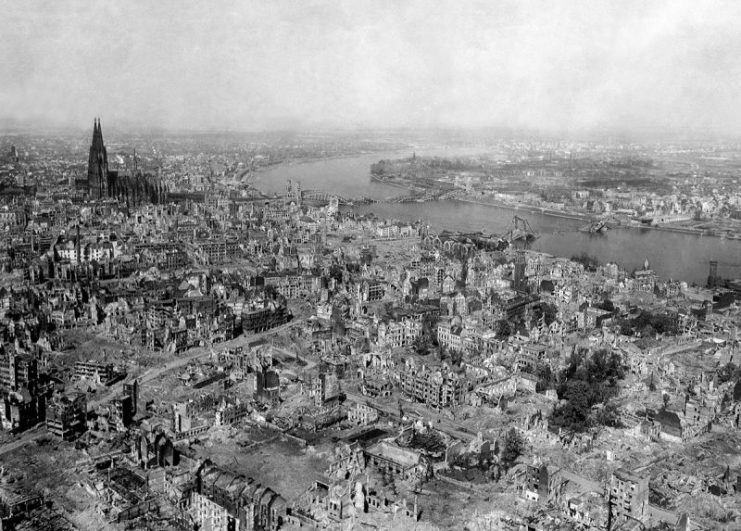 March 6th was day two of the Allied advance into the city, and something terrible happened, something that would trouble Smoyer for the rest of his life. E-Company, part of the 32nd Regiment of the 3rd US Armored Division, reached the city center by 10 am. Smoyer’s tank rolled into an intersection. A German tank was immediately spotted as it rolled out of sight behind a building. The order was given to destroy the corner of the building behind which it was hiding. The falling masonry disabled the main gun, but the machine gunner remained active and continued to engage. Live fire crisscrossed the intersection. 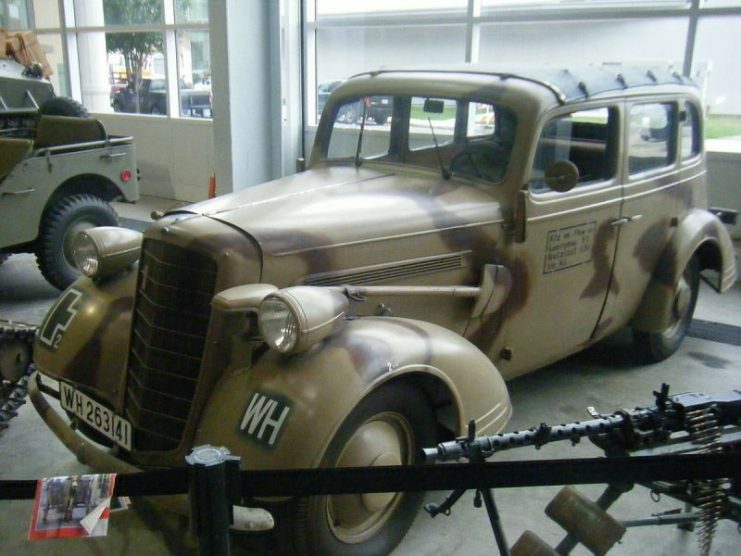 The Nazi forces, part of a specialist counter-attack force, were not going to give up easily. Anything and anyone caught in the cross-fire was simply cut down. Suddenly a black Opel staff car raced into the junction. It was hit several times before it stopped dead, right in the middle of the firing zone. It remained there for over an hour. At around midday, the fighting became less intense, allowing American infantrymen to cross the Ringstrasse. When they arrive at the Opel, they found a young woman, still alive, but only just. She was treated at the scene by American medics and taken away on a stretcher. From inside their tanks, both Smoyer and his counterpart in the German tank could see what was happening. Neither wanted to believe that they were responsible for the death of a civilian woman. 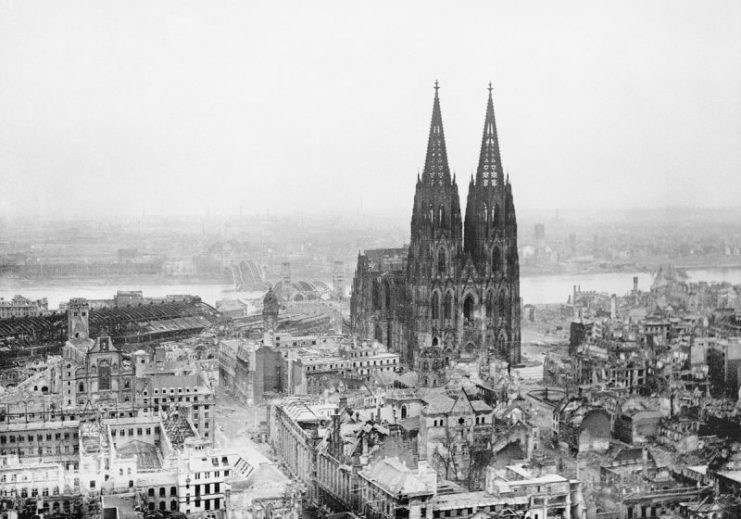 Over the decades that followed, neither man would discuss the events of that morning in Cologne. 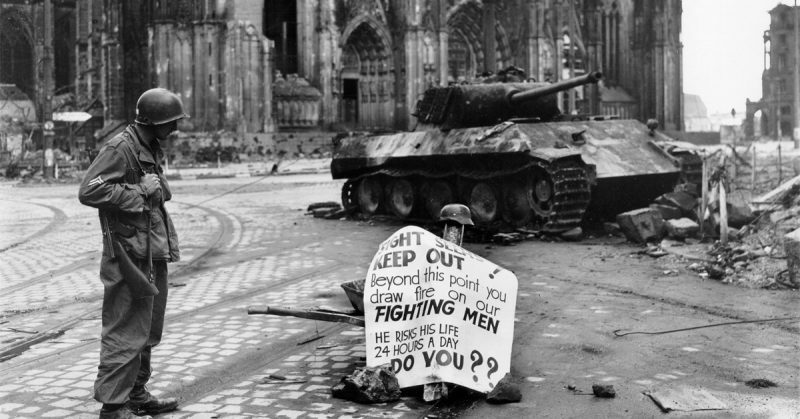 Smoyer went on to be hailed as a Hero of Cologne for destroying a Nazi Panther tank on the steps of Cologne Cathedral. 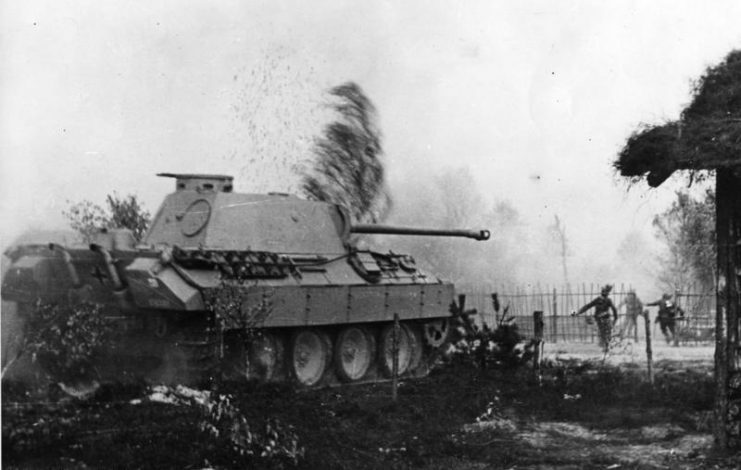 The Panther was described as a “monster” tank. Its gun was so powerful that it could blow a hole right through one US tank and take out the tank directly behind it as well. But Smoyer never sought the limelight, and it was a rare day that found him sharing war stories with anyone. Back in Europe, Gustav Shaeffer, the German gunner, had been tracked down by a journalist from Cologne when footage of the battle at Ringstrasse had come to light. Smoyer, then in his eighties, had also been contacted by an American historian and writer, Adam Makos. Both had seen the footage of what had happened at the intersection that day, and the aftermath. 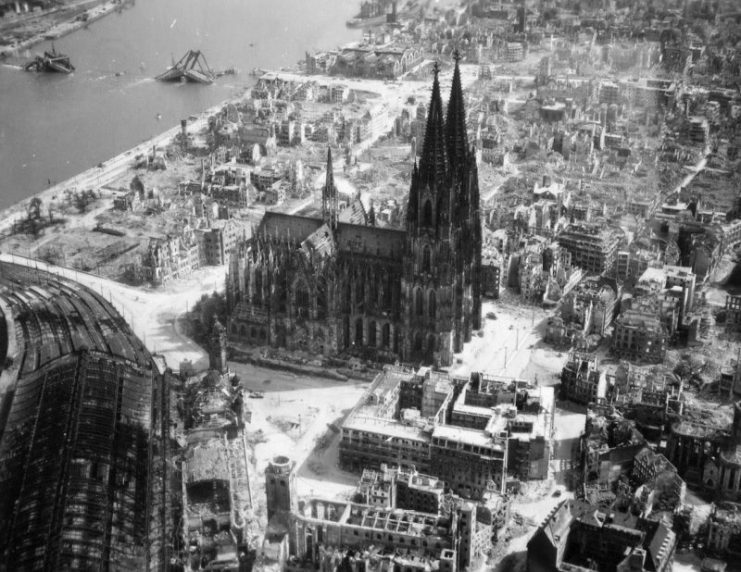 Cologne Cathedral stands intact amidst the destruction caused by Allied air raids, 9 March 1945. The next day, the two men visited the Ringstrasse together and surveyed the scene, the theater of all their nightmares over the past seven decades. “This is where I see her in my dreams,” said Smoyer. Both men had fired multiple rounds across the street where the black Opel had passed through their cross-hairs. Two-hundred yards along the street there is a churchyard. Sadly, the woman did not survive her injuries and was buried nearby. Her name was Katharina Esser, and she had been 26 years old at the time. It was assumed that she and her boss from the local grocery store had made a dash for freedom, desperate to escape the noise and danger of the battle. At the grave site, the two men laid flowers, later making peace with Kathi Esser’s surviving family.